Do you love grilling and throwing BBQ parties? 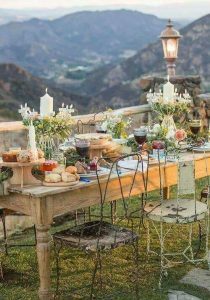 Well, summer is finally in the air and it’s time prep your backyard, deck, patio, or balcony for all your summertime dinner parties. 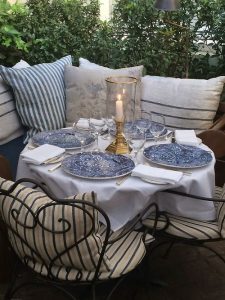 We listed a few excellent ideas on how to spruce up your outdoor dining area for you and your guests to enjoy during those summer nights. 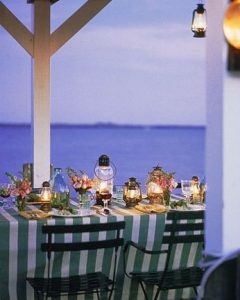 Hurricane Lanterns: Besides an outdoor dining set, these lanterns are a must have! They will keep your tabletop lit, creating a beautiful glow under the summertime sky. Having lanterns in various heights, color, and style adds a playful charm to your decor. You can also make it glamorous with all-white lanterns with matching all-white tabletop decor, like tableware, vase, and flowers. 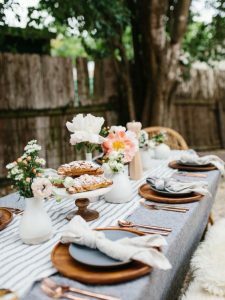 Comfy and Cozy: Soften things up on the outside by incorporating toss pillows, throw blankets, and an outdoor rug to your outdoor dining area. Turkish Towels are making a big scene at outdoor parties because they’re soft and light, the perfect cover up if you’re feeling a slight chill or if you just want to wrap yourself up without getting too warm. They also make a great table cloth. 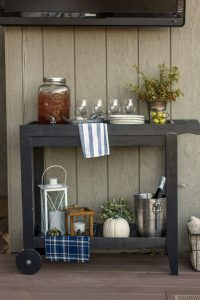 Bar Cart: Fun cocktails or delicious lemonade are essential to every successful BBQ. Roll out your bar cart next to your dining table for easy access. Style your cart with a fancy ice bucket and a mason jar filled with flowers. Flowers and Succulents: The only true tabletop decor you really need are flowers and/or succulents because they add style and color to your table. Make sure to keep them low so your guests can see one another from across the table. Small mason jars are great for flower arrangements because they’re the perfect height. You can also paint them white if you want a more classy look. Need more design tips or outdoor furniture? Come visit our showroom! Spring Renewal: Refresh Your Home with Less Money and Little Time	Design Obstacles? We Have Solutions.